Love shoes, but don’t love seeing them scattered around your bedroom or piling up by the front door? Luckily, there are many convenient and attractive ways to store shoes and boots. 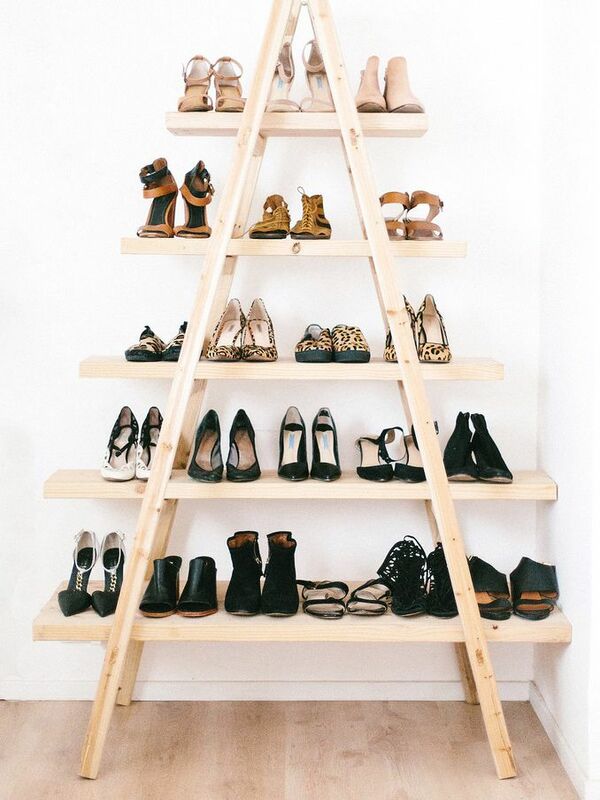 Whether you prefer traditional methods of storage or creative alternatives – like this amazing shoe ladder – whether you want to conceal your footwear or display it, the following storage ideas will help you sort out your footwear. As anyone who’s been to a shoe store knows, boxes are ideal for storing footwear. But the boxes that shoes come in aren’t always the best option; some of them are easily ripped and dented, and they’re just not that pretty to look at. But canvas or plastic shoe boxes are a practical and attractive way to store your shoe collection and these sturdy boxes usually come in multiple sizes, so you can keep everything from cowboy boots to sandals together​ while maintaining a matching, minimal aesthetic. Alternately, if you love to DIY, you can add some pretty paper to the boxes your shoes came in and customize the look. Everyone knows that when you don’t have a lot of space, the only place to go is up. Using that often-overlooked wall space above your head is a great way to make the most of a small apartment or closet. And that’s also true when it comes to storing shoes. Crown molding can be repurposed as a place for heels, but any type of floating shelf can help you turn unused bits of closet or wall space into a spot for shoes. Cubbies are cute, and often associated with early childhood, but there’s a practical reason this type of storage is used in kindergarten classrooms: it works! If you want to separate your shoes (or boots, bags and other accessories) in the simplest, least fussy way, just stick them in their own little cubes. A taller unit is great for families with kids – little ones get the cubbies close to the floor while adults take the top rows – but you can find this type of storage in any size. And if childlike isn’t your style, there are all sorts of more sophisticated options that make use of the same basic principle of open, easily organized spaces that make the cubby work so well. If your shoes are too nice to stash behind a closet door or inside a cubby or cabinet, flaunt them by displaying them right on your wall. First, install narrow shelves, strips of molding or dowels along your wall in as many rows as you need then sit shoes on top or hang them from their heels, and you have an instant, eye-catching, footwear storage solution. The humble (and affordable) hanging shoe bag is both a space-saver and an easy way to hide your footwear away in the closet, off the floor and out of sight. Other benefits of this storage method are being able to see all your shoes at a glance and being able to grab – and return – any pair in seconds. If you’ve never tried a hanging shoe bag because you don’t own enough shoes to fill all the slots, keep in mind that these bags don’t have to be used for shoes alone. Fill empty spaces with belts, oversized jewelry or other accessories. Somewhere between the traditional bookcase, shoe cabinet, and the quirky wall display, you can show off your shoes and your taste in furniture at the same time. Cases with glass doors keep shoes visible while protecting them from dust, and models with open fronts retain their vintage look while letting you access your footwear easily. A bookcase or shelving unit originally intended for other items can be interpreted in endless ways, depending on whether you’re drawn to antiques, feminine styles, modern lines or industrial materials. If most of your shoes are boots, all you need to store them is a few boards with pegs attached. This type of simple boot rack can be found at a garden and outdoor stores or made at home as a DIY project to customize size and shape. They’re often seen on porches or in mudrooms holding wet Wellingtons, but there’s no reason you can’t bring one indoors and put it to work displaying all types of boots. And don’t let the indoor setting stop you from making your boot rack as rustic as you like.